Almost all people in the world know the famous tropical fruit -banana; but not everyone knows much about its sister fruit - plantain. People may know the name "plantain", but they may not know what the fruit look like exactly. As a matter of fact, banana and plantain are a pair of intimate sisters in the plantain family. Based on his studies on the cells, genetics, and breeding of the two sisters, Chesman believed that the two fruits are actually natural hybrid. They all come from two natural wild species, i.e. the Ajia banana and the Luna banana. Banana originates from the diploid and triploid of Ajia banana, while Plantain originates from the diploid, triploid or tetraploid the Ajia banana. According to the 15 major shape scoring methods of Simons, edible bananas are divided into two categories, i.e. banana and plantain. Bananas include 17 varieties such as the standing banana and the sitting banana; while plantains have 15 varieties such as Gong Banana, Big Gray Plantain and Small Gray Plantain. Comparing from their botanical properties, the pseudo-caudex of bananas has brown ribbons, while plantain has no ribbons or very few ribbons. The leafstalks of bananas spread out and have wings, while the leafstalks of plantain close up, and have no wings or very few wings. The ears of bananas have fine wools, while plantain ears have no wools at all. Banana is a typical plant of the tropical areas, and it is suitable for plantation in places of low latitude. Each mu of bananas can produce as much as 6000-7000 Jin fresh bananas each year; while, plantain is more cold resistant, and thus can be planted in mountain areas in el. 1600 meters, or even be transplanted to places as far as in 30( north altitude. 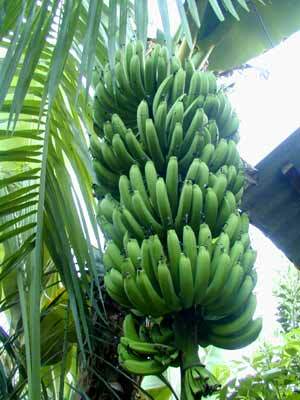 Each mou (1/15 hectare) of plantain could produce as much as 10,000 Jin fresh bananas. Banana and plantain stalks can store a lot of water. A prairie fire can burn a verdant banana woods pitch-dark; but it only takes a few days for the burned banana and plantain plants to grow out new and verdant leaves. Moreover, the plants will begin to blossom and fructify again. It's not strange that people have the proverb "fire burns its leaves but not its heart". When we eat bananas, our first feeling is that its strong fragrance is especially enticing; but when we eat plantain, we will feel a faint fragrance breezes on our faces in a sudden. In spite that they have different flavors, both bananas and plantains can be made into fruit syrups, fruit jams, and canned fruits. Banana trees and plantain trees all contain long and thin fibers, which can be used as hemps for weaving banana cloth. The banana cloth is light and excellent, better fibers can be used as the materials for making summer clothes, mosquito-curtains, curtains, flamboyant bags, and fashionable hats; more coarse fibers can be made into ropes used on ships and in factories; and the most inferior fibers can be used to make paper. The paper made with banana fiber is quite wearable, therefore can be used for printing notes and more than 30 types of other high-rank paper products. Banana and plantain fruits have very high nutritious values. According to our analysis, bananas are rich in vitamin C and vitamin B6 contents; while plantain contains a lot of vitamin A. These vitamins are all important to the human health. A committee of the American Congress once recommended that "bananas and plantains are ideal foods with low fat, cholesterol, and salts. They have a common feature, i.e. a food with low sodium and high kalium; therefore, they can be used as supplementary foods for restricting illness caused by sodium and salts. Besides, banana and plantain can also be used as the food of patients who are suffering from adiposis and caducity; and they are also recommended to treat children's diarrhea in an attempt to restrict the supplying source of carbonhydrates in the enteritis. Bananas and plantains are a pair of intimate sisters; and there are also quite moving stories about them. It's said that the native land of banana is in India. In the 3rd century A.D., Alexander led an expeditionary attack on India and he found banana plants there. Ever since then, banana spread to Africa and America. Nowadays, banana is already a global tropical plant and it even enjoys the reputation of green ivories. In the 1950s, the annual output of bananas in the world was more than 10 million tons; now, this figure has grown to more than 40 million tons. Honduras, Panama, and Costa Rica enjoy the reputation of "countries of bananas", and they export large amounts of bananas each year; in the meantime, Brazil, Ecuador, and India are also countries known for producing bananas. Rwanda and Burundi are famous for producing bananas in Africa. On the mountain slopes of these countries, banana orchards stretch out one by one, which are verdant and luxuriant; strings of bananas are hanging down from the plants, and the farmers' houses are also sheltered in the banana plantations. The people of Burundi love to grow banana trees, because, for one reason, banana is one of their major food; the other reason is that banana is also an important material for them to brew beers and wines. Banana wine is a traditional drink of the Burundi people and their national wine. The people in Burundi consume a large amount of banana wines each year. Since the wine does not contain too much alcohol, the villagers may drink more than 1 kilogram of it each day; and some people even take banana wines as drinking water. During festivals or on important occasions, the Burundi people all like to drink banana wines for celebrations. The people in Rwanda favor a kind of banana beer. They plant bananas not for eating them, but for brewing beers. The bananas they produce are mainly used to distill various beers, the beers are clear and sweet, and can even compare with the grape wines of the Mediterranean district. The local people are proud of their beers and they also develop very deep feelings in their beers. In important occasions, beers are the necessary parts of the preparation; and beers are also used as gifts among relatives and friends. A Rwanda farmer may be looked down upon if he has no banana orchards. There are bars in both the countryside and in big cities in Rwanda; banana beers are sold everywhere in the country; and the money spent on banana beers by each Rwanda person claims for one 4th or one 6th of his or her personal consumption.